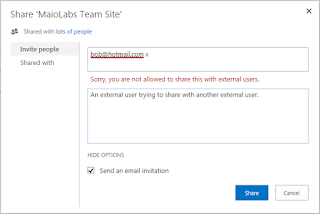 In our SharePoint deployments in the past, we've often had the need to share content with external users, which are people that are not part of our company or organization. Setting this up in an on premise environment often required a significant deployment of a SharePoint extranet, with some complex network configuration. 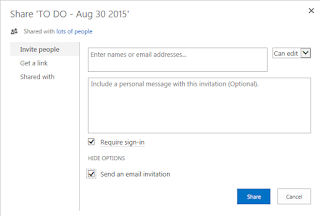 Office 365 makes sharing with external users very easy and gives administrators some great controls over it to ensure that its both secure and enables collaboration between internal and external users. External users might be partners, customers, auditors, or generally those that cannot login to our corporate network. From a technical standpoint we often think of them as people that do NOT have an account in our corporate Active Directory. 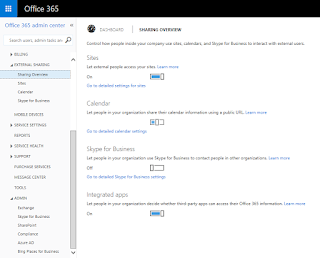 In Office 365, you can also think of an external user as one which does not have a license to your SharePoint Online sites or Office 365 subscription. From a governance and security standpoint, we typically do not want to give external users an AD account or Office 365 license, so this makes sense. Cannot be a site collection administrator or access any of the site collection administrator capabilities. Cannot create their own personal One Drive for Business library. Cannot search against everything, cannot search across site collections and cannot access the Search Center. Cannot create their own personal sites, or a My Sites site. Cannot access or view the company newsfeed. Cannot change their user profile (things like their picture or contact information). Cannot open downloaded documents which are IRM protected (Information Rights Management). There are of course many other capabilities that external users can access, including viewing, editing and collaborating on content. As described below, you can control the permission levels assigned to external users so that they can only view content, or so they can view and edit content. 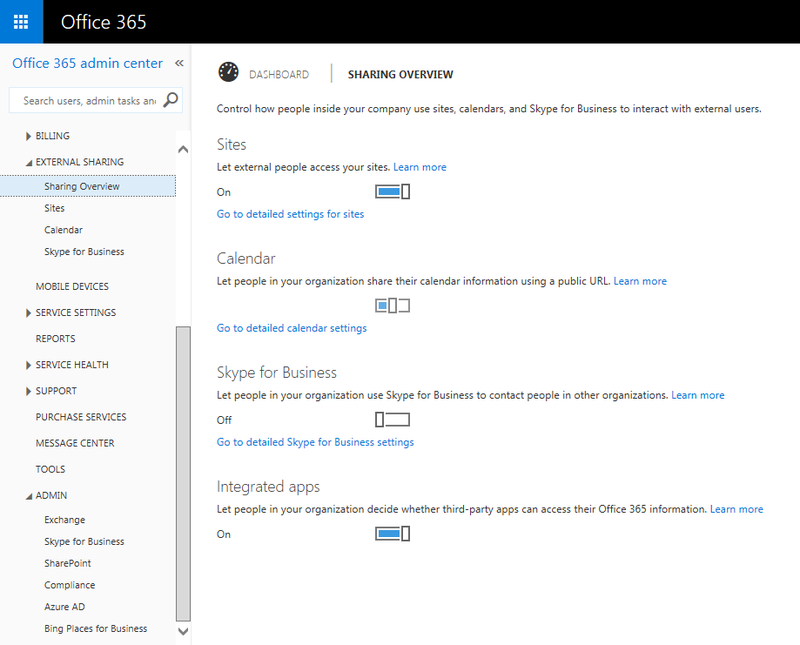 There are several options available on this page, including options for Sites, Calendars, Skype for Business and Integrated Apps. We're focus on Sites for this article. Under sites, you'll see a global ON and OFF switch for External Sharing - ensure that it is ON. 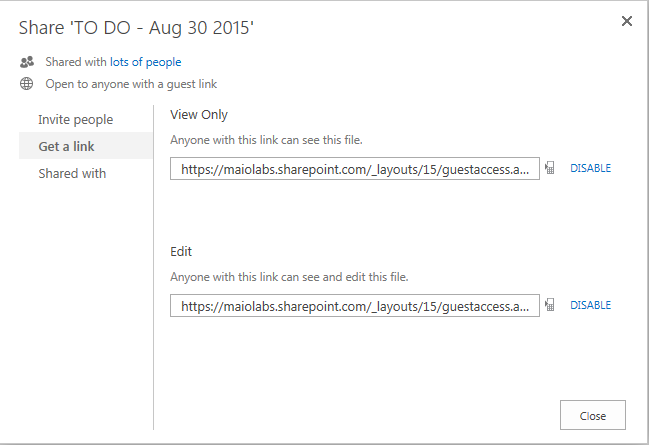 From this page, through the controls at the top, you can control the External Sharing settings for all site collections in the tenant. The Let external people access your sites check box reflects the same state as the global ON and OFF switch mentioned above. Selecting either the No anonymous guest links. Only allow sharing with authenticated users or Allow sharing with anonymous guest links for your sites and documents radio button will select whether only authenticated user access is permitted for external users, or if both authenticated users and anonymous users are permitted. Note: Each site collection remembers its previous setting, so if you have some site collections with only authenticated access and others with both authenticated and anonymous access, changing this radio button will change all site collections back and forth between their current settings or only allowing authenticated access. From this page you can select individual site collections, click the pencil icon to edit their settings and determine if external user access is permitted and if only authenticated users or if both authenticated and anonymous users are permitted. Again, this can be done individually for each site collection here. However, these controls provide the same capabilities as those listed above at the global administration level. If I modify the settings here in the SharePoint Admin Center for a site collection, the same change is reflected in the global Admin Center. See below for the administrative role needed to control external sharing. 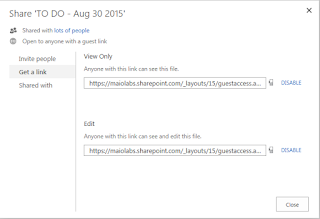 The default External User settings for SharePoint Online is to have External Sharing turned ON at the global level. 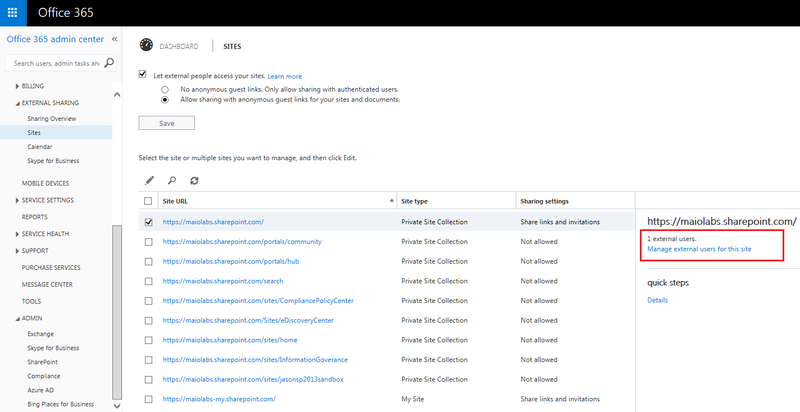 However, external user sharing is turned OFF for new site collections - it must be explicitly turned ON for each site collection. This is a good security feature, helping to ensure that you do NOT accidentally share sites externally. In order to control External Sharing options, you must have either the Office 365 global administrator role or a SharePoint Administrator role. You cannot control whether a site is share-able externally simply as the site collection administrator or from within the site settings. 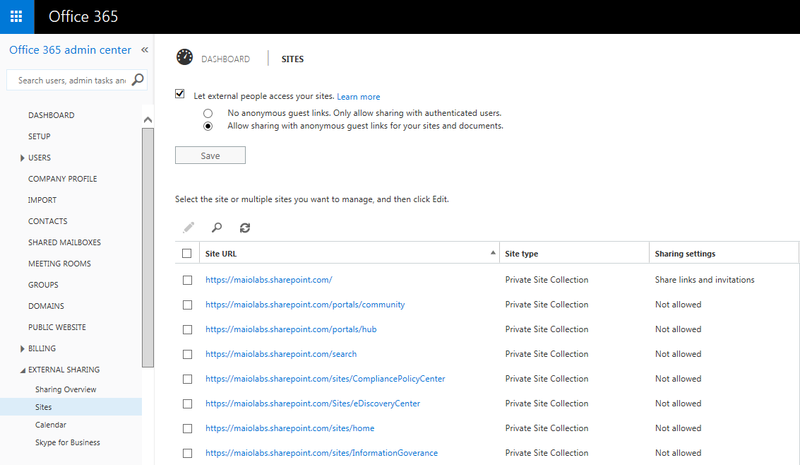 Once you configure a site collection to be share-able in the global Admin Center and/or SharePoint Admin Center, then you select which external users a site is shared with from within the site collection, as discussed below. Security Note: From the Office 365 Administrative interface it appears that a global administrator role would have the ability to control the global and SharePoint administrative settings for external sharing, whereas the SharePoint administrator role would only be able to control the SharePoint Admin Center settings for external sharing. However, in testing I have found that this is NOT the case. 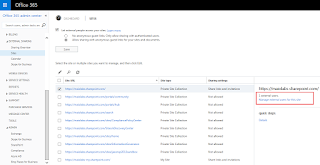 It appears that even if a user that has ONLY the SharePoint Administrator role they can control these particular settings in both the global Admin Center and the SharePoint Admin Center. So, although some settings can be disabled at the global admin level and enforced automatically on all site collections, like turning anonymous access OFF on all site collections at once, a SharePoint administrative role can simply navigate to the global Admin Center and turn them back ON (even though they are not a global administrator). 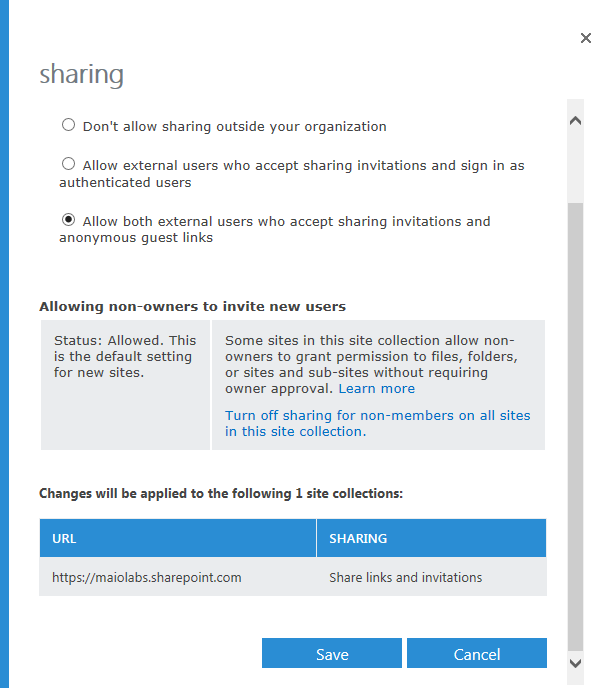 Even if my user account is the site collection administrator on only 1 site collection, if I have the SharePoint administrator role in the Office 365 tenant settings, I can change external sharing settings for all site collections, both in the global Admin Center and the SharePoint Admin Center. 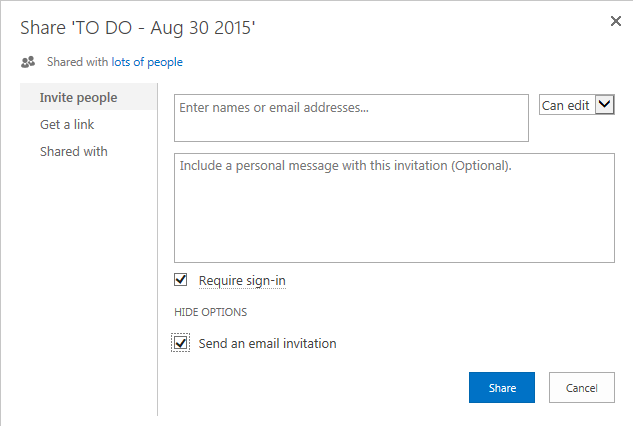 If you require that external users login with a username and password when accessing an Office 365 site that's been shared with them, then you must share with an authenticated user. An authenticated user in this case must be a user with either a Microsoft account or an account assigned to them from Office 365, or what is sometimes referred to in Microsoft articles as a school or work account. A Microsoft account is what used to be called a Windows Live ID, and can actually be any account used to access Outlook.com, OneDrive, Windows Phone, or Xbox LIVE. If you have an account to access any of these services, then you already have a Microsoft account. For example, my Microsoft account is still my @hotmail.com account. So, if I want to share a site with an external user that has a Microsoft account named bob@outlook.com then I can simply share the site with that email address. 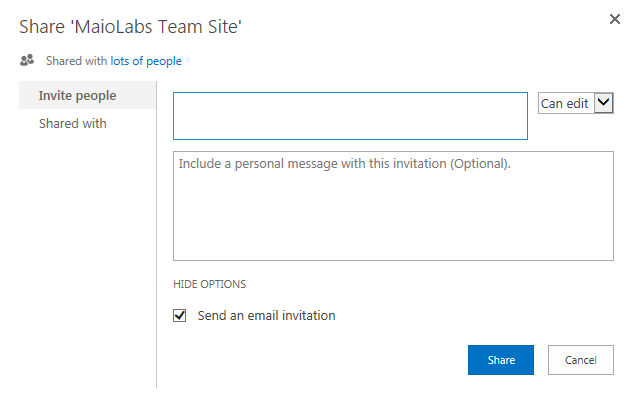 The user will receive an email invitation and when they click the link within, they'll need to login using their existing bob@outlook.com username and password. Office 365 will authenticate them against their Microsoft account. 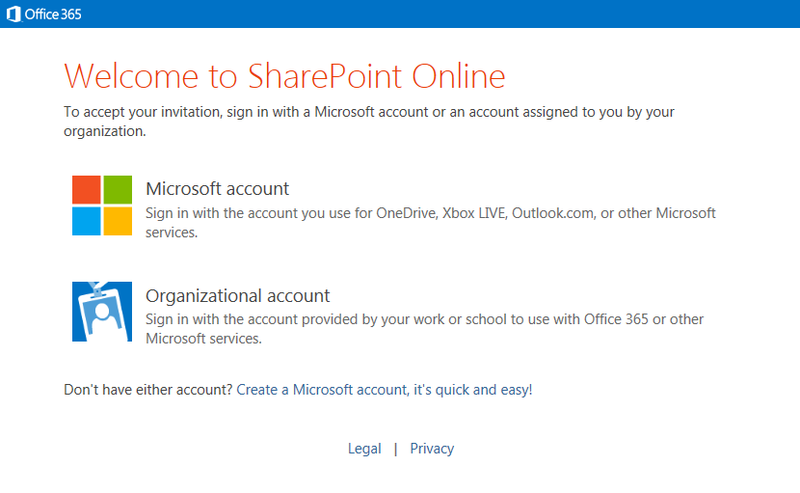 A school or work account in this context is a user account that has been created for users within the Office 365 tenant. 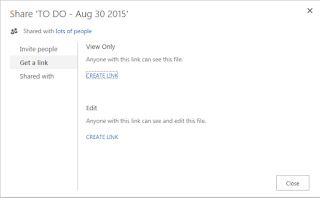 For example, when creating my Office 365 tenant I can optionally register and verify other domain names that I own. Once that step is complete, I can create accounts within Office 365 which use that domain name. So, if I register and validate the domain CONTOSO.COM in my Office 365 tenant, I can then create an account called bob@contoso.com. In this case, if I need to share a site with an external user that does not already have a Microsoft account (and is not interested in getting one, even though they're free and really easy to register) I can simply create an account for them in my tenant. I can then send that user an email invitation to access their new account with the username and password that I choose for them. Finally, I can share a site with that user account and they'll be able to access the site even though they do not have an Office 365 license. Please see below for some interesting controls (or lack of) about this scenario. You may share a site with external users at the site collection level only. So, if you share a top level site collection external users will gain access to all subsites, lists and libraries below that as well. this is accomplished by clicking the Share button in the top right corner of the Office 365 page. The following window will then appear where you can enter either the email address to their Microsoft account or the user name from the Office 365 tenant which represents the user's account. Notice on the left side of the window you can also see who the site is currently shared with by clicking none other than Shared with. If I access this same Share button from a subsite, I can share the site collection with an external user from there as well, but notice the message which appears at the top of the new window letting us know that sharing the subsite will also give the external user access to the site collection. 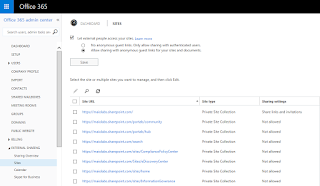 Security Note: When you share a site collection with an external authenticated user and you select to give them the ability to view and edit content, that user is made a member the Members group within the site collection. This means they have Contribute rights on the entire site collection. It also means that they are now able to share the site collection with other authenticated users. That can be a useful feature for them, and it can pose security risks. If they try to share with other internal authenticated users, they are permitted to do this, but a request is first sent to the site owners group for approval, before those internal users are actually given access. 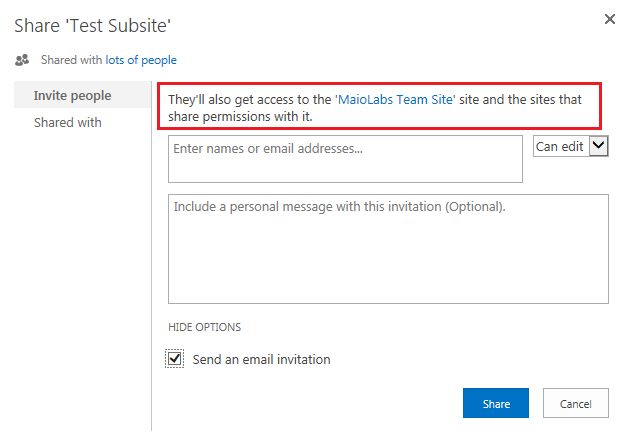 Its typically recommended that if you're going to share sites in this way that you create a separate site collection within your Office 365 tenant specifically for sharing with external users and you ensure that no sensitive content is placed within that site collection. 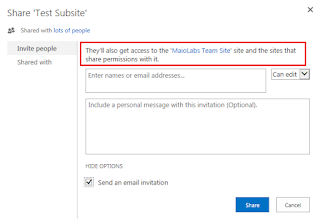 The Require sign in option does just that, requires a user to sign in when they access a document through a shared link. See below for more information on the Get a link option. Sites can only be shared with authenticated users. They cannot be shared anonymously with external users. Only documents can be shared anonymously with external users. Once anonymous access is enabled for a site collection, as shown above, sharing a document anonymously is accomplished through the process shown above to share a document. In this window, you can also click the Mobile phone icon beside each link, which will give you a QR code that you can send to users enabling them to easily open this document on the mobile phone. 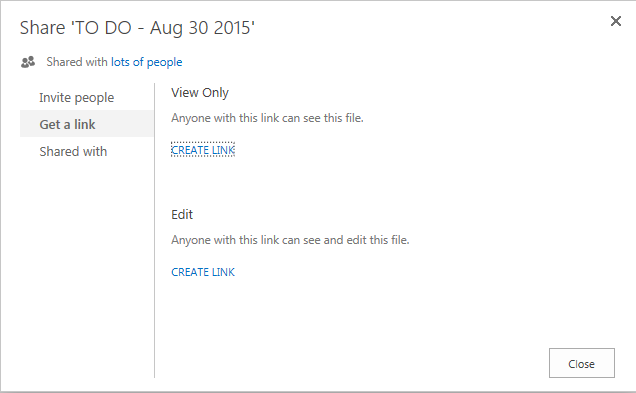 Finally, you can also disable links to specific documents within this window through the disable link. Security Note: Its important to understand that by sharing documents anonymously through links like this, any external user that has the link can access the document. So, if an external user inadvertently or maliciously forwards an email with such a link to another external user, that user will also be able to view or edit the document without having to login. As a result, it is important to limit the external users with which documents are shared, and to ensure that these anonymous links to get reviewed on a regular basis and disabled once external users no longer have a need to access documents. This should be part of your information governance policies. 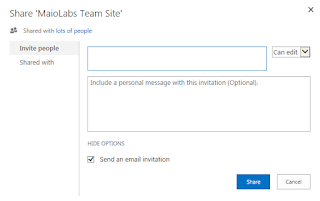 Overall, sharing sites and information with external users is much simpler in Office 365 than its ever been, and Microsoft has provided some great security controls around this capability to ensure that sharing occurs in a secure and controlled way. Once you configure a site collection to be share-able in the global Admin Center and/or SharePoint Admin Center, then you select which external users a site is shared with from within the site collection, as discussed below.